The aim of the study was to compare the protective efficacies of a single and repeated daily oral doses (5, 20, 80, and 320 mg/kg) of a Curcuma longa extract (C. longa) enriched in curcuminoids (95.4%) with those of metformin (100 mg/kg) against intermittent foot shock stress triggered body weight changes and thermoregulatory responses in male and female mice. No significant effects of both the test agents on basal rectal temperature, or on short duration of foot shock stress triggered transient hyperthermia were observed one hour after their single oral doses. However, metformin-like and dose dependant efficacy of the extract against body weight losses, elevated core temperatures, and stress induced transient hyperthermia were observed after its 5, 7, and 10 daily oral doses. Similar were also the cases for their observed effects in tail suspension test for antidepressants conducted one hour after their 11 daily oral doses, and in pentobarbital-induced sleep tests conducted a day after their 11 daily doses. Minimal effective doses of the extract after its repeated daily doses on all quantified parameters and in both male and female mice was 5 mg/kg/day, and quantitatively efficacies of its 20 mg/kg/day doses was always quite similar to those of 100 mg/kg/day metformin. These observations reveal that C. longa could be functionally a metformin-like desensitizer of biological mechanisms and processes involved in stress triggered thermoregulatory and other physiological responses, and that it could be a better therapeutic option for prevention and cure of co-morbid psychopathologies accompanying environmental stress. The yellow colored and quantitatively the major diarylheptanoids encountered in Curcuma longa (a plant of the Zingiberaceae family) rhizomes are now often referred to as turmeric curcuminoids. Curcumin was the very first pigment isolated from the rhizomes of the plant widely used in modern food industries as a coloring agent or for manufacturing curry powders. Due to its antimicrobial and strong irreversible binding properties to cotton, silk, and woolen fibers it has since long been used also as a textile coloring agent [1,2]. The numbers of reports reconfirming broad spectrums of microbicidal efficacies of curcumin and other turmeric curcuminoids have continued to increase during more recent decades, and analogous is also the case for their diverse other therapeutically interesting bioactivities identified since 1970s [3,4]. They have not only added experimental evidences in support of their medicinal and dietary uses in diverse traditionally known systems of medicine and health care, but also suggested that they are structurally and functionally unique drug leads, and that they could be potentially useful for prevention and cure of diverse spectrums of psychopathologies and metabolic disorders. Available preclinical and clinical information on turmeric curcuminoids not only reveal that they are pleiotropic protective agents, but also suggest that improving their oral bioavailability could be feasible means for obtaining therapeutic benefits from them [5-10]. Despite of such advances though, many questions concerning their pharmacological sites and modes of actions still remain controversial, or at the best speculative only [11,12]. Analogous is also the situation for numerous other edible and other phytochemical isolated from traditionally known medicinal and edible plants commonly used in diverse traditionally known systems of medicine, or in modern nutritional therapies. In view of the situation, it has been suggested that numerous edible phytochemical can contribute to the psychological well being of consumers, and that modulation or regulation of brain plasticity could be involved in their physical and mental health benefits [13,14]. Numerous observations made during the course of our efforts to properly define psychopharmacological activity profiles of edible and traditionally known medicinal plants  are also in agreement with such suggestions. Therefore, we have identified, standardized and pharmacologically validated a mouse bioassay system for detecting metabolic as well as brain function modulating potentials of medicinal plant extracts and their known bioactive constituents [16-19]. This bioassay system is now regularly used in our laboratories for estimating pharmacologically interesting dose range and treatment regimen of test agents potentially useful for prevention and treatments of obesity and diabetes associated mental health problems. During the course of such efforts it was observed that repeated daily treatments with the antidiabetic drug metformin effectively suppresses diverse physiological stress responses in mice, and that its observed effects are quite analogous to those of several edible phytochemicals . Vast majorities of therapeutically interesting bioactivities of metformin known to date  are quite analogous to those of curcuminoids, and it has been reported that in cellular and other in vitro models the curcuminoids are several hundred fold more effective than the antidiabetic drug . Therefore, it was of interest to experimentally verify the possibility that metformin like stress response modulating efficacies of curcuminoids are also involved in its therapeutically interesting bioactivities observed in animal models [5,22]. Observations made during the very first set of experiments conducted with a commercially available C. longa highly enriched in curcuminoids (95.4%), and using metformin as reference drug, are summarized in this communication. Implication of the observations for more rational medicinal uses of curcuminoids and C. longa for prevention of chronic diseases, or for better definition of their therapeutically relevant bioactivity profiles, are also discussed in short. Male and female Swiss albino mice (20±5g) were obtained from the Central Animal House of the Institute of Medical Science, Banaras Hindu University, Varanasi, India (Registration Number: 542/AB/CPCSEA). Prior approval from the Central Animal Ethical Committee of the University (CAECU) was taken for this study protocol (Dean/2014/CAEC/602, dated 30-05-2014). They were housed in groups of six in polypropylene cages at an ambient temperature of 25±1 °C and 45–55% relative humidity, with a 12:12 h light/dark cycle. They always had free access to commercial food pellets and water ad libitum, and they were acclimatized to laboratory conditions for at least 1 week before using them for the experiments. Behavioral experiments were conducted between 09.00 and 14.00 h, and "Principles of laboratory animal care" (NIH publication number 85-23, revised in 1985) guidelines were always followed. The C. longa highly enriched in curcuminoids (95.4% by HPLC; Figure 1) used in this study, and its analytical characteristics, were kindly supplied by R&D Center, Natural Remedies Pvt. Ltd., Bangalore, India. 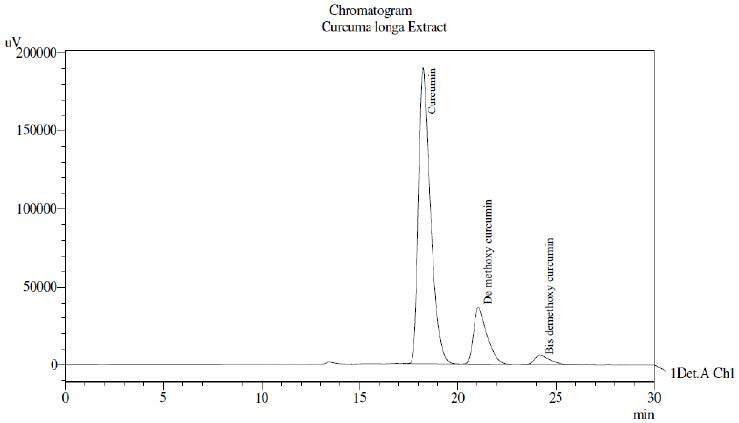 The extract was analytically characterized by its contents of curcumin (>77.94%, w/w), demethoxycurcumin (>15.03%, w/w) and bisdemethoxycurcumin (>2.52%, w/w), by uses of a Shimadzu High Performance Liquid Chromatographic System LC 2010CHT with UV & PDA detector in combination with Class LC solution software. Metformin (Ranbaxy Laboratories, Gurgaon, India) and other chemicals were procured from different commercial sources. For the reported experiments, the animals were randomly allotted to different experimental groups of six animals each. Metformin (100 mg/kg) and graded oral doses (5, 20, 80, and 320 mg/kg) of C. longa were suspended in 0.3% carboxymethyl cellulose (CMC) and orally administered for 11 consecutive days (application volume 10 ml/kg) to different groups of animals. The vehicle treated control groups were similarly treated with CMC only. Except for the last day of an experiment (i.e. on day 12), all tests were conducted 60 min after the treatments. On days 1,5,7 and 10, after 60 min of treatments and initial rectal temperature measurements, an individual mouse from each group was placed in a black box (24×29×40 cm) with a grid floor for 1 min. Electric foot shock through the grid floor (2 mA, 50 Hz of 2 ms duration) was delivered for stress induction. After 10 sec of their stay in the box, five consecutive foot shocks of 2 mA at 10 s intervals were given through the grid floor. Immediately thereafter, the animals were placed back in their home cages, and stress induced change in rectal temperature was quantified after 10 min stay in their home cages . On the 11th experimental day, and after 60 min of drugs administrations, individual mouse were hung on its tail on a wire in an upside down posture. After initial vigorous movements, the mouse assumed an immobile posture and the period of immobility during a 5 min observation period was noted . Before oral administrations of test agents, body weight and rectal temperature of animals were recorded. On the 12th day of an experiment, no oral treatments were given, and pentobarbital (40 mg/kg, i.p. ; Loba Chemie Pvt. Ltd., Mumbai, India) was administered to all control and drug treated groups of mice. Onset of sleep and duration of sleep was measured by a blind observer . On this experimental day, the rectal temperatures and body weights of animals were recorded immediately before pentobarbital challenge. Mean±standard error of mean (SEM) was calculated for the observed values in each experimental group. Statistical analysis was performed by one way analysis of variance (ANOVA) followed by Student-Newman-Keuls multiple comparison test. GraphPad Prism-5 (GraphPad Software Inc., La Jolla, California, USA) was used for statistical analysis. Origin-Pro 8 (OriginLab Corporation, Massachusetts, USA) software was used for graph representation. A p-value less than 0.05 was considered as statistically significant. Mean body weights of vehicle and other treated groups of male and female mice are summarized in Figure 2a,b. As expected, the animals of both control groups continuously lost their body weights during the course of the experiments, whereas those of the 100 mg/kg metformin treated ones started gaining weights after its 5 daily doses. Changes in the mean body weights of the 5 mg/kg/day C. longa treated male or female groups were quite analogous to those of the corresponding metformin treated ones. Mean body weights of the male as well as female metformin treated groups were statistically significantly higher than the corresponding control ones on the 11th and 12th days of the experiments, and analogous were also the cases for the 5, 20 and 80 mg/kg C. longa treated male groups. In females, mean body weights of all C. longa treated groups from day 7 onwards were always significantly higher than those of the vehicle treated one. These observations reveal that efficacy of C. longa in counteracting foot shock stress triggered body weight looses in female animals is somewhat higher than in male animals. Daily oral doses of C. longa higher than 20 mg/kg/day were always more effective in counteracting intermittent foot shock triggered body weight losses than 100 mg/kg/day metformin. * denotes statistically significant difference (Two way ANOVA followed by Bonferroni post tests) relative to control group (* = p<0.05). Mean basal core temperatures of different groups of male and female mice recorded during the course of the experiment are shown in (Figure 3a,b). It is apparent from these figures that the mean basal core temperatures of both the vehicle treated control groups continued to increase gradually during the course of the experiment, whereas those of the 100 mg/kg/day metformin treated ones remained almost constant on all observational days. Metformin like preventive effect of C. longa on foot shock stress and daily handling and treatments induced elevation of basal core temperature was apparent even after its lowest oral dose (5 mg/kg/day) tested. In both male and female vehicle treated control groups, the magnitude of foot shock stress triggered transient hyperthermia gradually increased during the course of the experiments (Figure 4a,b). Although the magnitude of stress induced transient hyperthermic responses in vehicle treated female mice were somewhat lower than that observed in male controls, there were no statistically significant differences between the mean values of the two groups on all test days. Such responses of the metformin or any of the C. longa treated groups observed after their single oral doses were also not statistically significantly different from the corresponding control groups. In both female as well as in male mice, statistically significant antagonistic effects of metformin (100 mg/kg/day) against such responses were observed on the 5th and subsequent observational days. Analogous were also the observed effects of daily treatments with 20 mg/kg/day or higher daily doses of C. longa. However, in female mice, the efficacy of 5 mg/kg/day dose of C. longa was somewhat lower than those of its higher ones, and statistically significant effect of this dose of the extract in male mice was observed only after its 10 daily oral doses. Although the efficacy of all tested doses of C. longa increased somewhat with increasing numbers of treatment days, even after its 10 highest daily oral doses (320 mg/kg/day) tested it did not completely abolish the foot shock stress triggered transient hyperthermic responses in both male and female mice. All tested doses of C. longa and metformin significantly lowered the immobility period of mice after their 11 daily doses. It is apparent from the results summarized in (Figure 5a and 5b) that the efficacy of C. longa increased in dose dependent manner. Statistically significant and metformin like effect of C. longa were observed in both males and females even after its lowest daily dose (5 mg/kg/day) tested. Efficacies of 100 mg/kg daily dose of metformin in males and females were almost equal to those observed for 20 mg/kg daily dose of C. longa. Results summarized in (Figure 6a,b) revealed that 24 hours after treatments with C. longa for 11 consecutive days, dose dependently shortens sleep induction period and prolongs duration of sleep induced by pentobarbital in both male and female mice. These statistically significant (p <0.05) effects of the extract were qualitative analogous to that of metformin. Quantitatively, the efficacy of 20 mg/kg daily dose of C. longa was almost equal to that of 100 mg/kg/day metformin. Efficacies of both the test agents as central nervous system depressants, or as inducers of pentobarbital metabolizing enzymes, were similar in both male and female mice. Metformin is the antidiabetic drug of first choice for combating diverse spectrums of comorbidities commonly associated with diabesity . A few more recent reports have revealed, that alterations of gut microbial ecology caused by this biguanide derivative is involved in its therapy relevant bioactivities [27-29] and that it could also be useful for combating diverse spectrums of psychopathologies commonly associated with diabesity and other chronic diseases [30-32]. It has since long been well recognized that curcuminoids and diverse types of medicinally used C. longa preparations are also metformin like pleiotropic protective agents with anti-microbial activities . Based on the results of clinical studies, it has recently been suggested that turmeric extracts could be used as an adjuvant to metformin therapies for more appropriately meeting the therapeutic demands of diabetic patients . Observations reported in this communication are not only in agreement with such convictions, but also strongly suggest that the therapeutically interesting broad spectrums of bioactivities of curcuminoids and metformin are due to their modulating effects on microbiota-gut-brain-axis, and that their oral bioavailability are not necessarily a reliable predictor of their efficacies observed after their repeated daily oral dose. Although the physiological role of the gut-brain axis has since long been known, it was only during the present decade that it became apparent that gut microbiota is an endocrine organ  and that the gut microbial ecology is a regulator of diverse physiological stress responses  involved in etiologies, pathogenesis, and progression of diabesity and numerous other chronic diseases [37-38]. All these three intermittent foot shock stress triggered responses quantified in this study (i.e. elevation on of core temperature, loss of body weight, and transient hyperthermia) were either suppressed, or completely antagonized, by repeated daily oral doses of C. longa or metformin. Hereupon it was interesting to note that no significant effects on basal core temperatures of male and female mice, or on foot shock stress triggered transient hyperthermia, were observed one hour after single doses up to 320 mg/kg of C. longa, and that even its 5 mg/kg daily doses administered for 5 or more consecutive days afforded complete protection against intermittent foot shock stress triggered slight elevation of basal core temperatures observed during the course of the experiments. Analogous were also the effects of the extract on foot shock stress triggered transient hyperthermia and long term effects on body weight losses, where its statistically significant effects were also observed after its repeated daily 5 mg/kg oral dose. Therefore, the minimally effective daily oral doses of the tested C. longa extract for affording protection against stress triggered physiological responses seems to be 5 mg/kg/day, and that its daily oral doses as high as 320 mg/kg are well tolerated by mice. Extensive oral bioavailability studies conducted with curcumin and other curcuminoids [8,39] have revealed that even after their very high oral doses (up to 1g/kg) their blood levels are undetectable in mice. Although, most reports dealing with therapeutically interesting bioactivities and bioavailability of orally administered curcumin and curcuminoids have dealt mainly with their fairly high acute or repeated daily oral or intraperitoneal administered doses, a few others have revealed diverse bioactivities of their oral doses lower than 5 mg/kg/day. Except for their observed efficacies in tailsuspension test for antidepressants and some other bioassays [40,41] most other low dose efficacies of curcumin and curcuminoids have been observed after their repeated daily doses only. The observations reported in a recent and more systematic study reconfirm this inference for their orally administered doses . Since like other edible phytochemicals, curcuminoids also modulates diverse cellular pathways involved in adaptive stress responses , it seems reasonable to assume that the low dose efficacies of curcuminoids observed after their repeated daily oral doses in this study, and in other laboratories, are due to their adaptogenic or stress response suppressing effects, and that some of their pharmacological sites of actions lie within the gastrointestinal tract. In any case, observations reported in this communication revealed that C. longa is a metformin like stress response suppressing agent, and that in both male and female animals their efficacies increased with increasing number of daily oral doses. In general, efficacies of 20 mg/kg/day C. longa on all quantified parameters in the bioassay were similar in magnitude to those observed after 100 mg/kg daily oral metformin doses. Hereupon, their relative efficacies in male and female mice were not always equal in magnitude. After 10 daily oral doses, efficacy of 100 mg/kg/day metformin in antagonizing stress triggered body weight losses in females were somewhat higher than that observed in males, and on this day the efficacy of 5 mg/kg/day C. longa in both male and female mice were similar in magnitude. Such was not the case in stress induced hyperthermia test, where efficacy of 10 daily doses of C. longa 5 mg/kg in females was somewhat lower than that observed for the tested dose of metformin. The observation that the dose dependant efficacies of 10 or 11 daily doses of C. longa in stress induced hyperthermia, tail suspension, and pentobarbital induced sleep tests increased further after its 80 and 320 mg/kg/day doses in both males and females could indicate that its efficacies in these tests are most probably independent of its observed protective effects against intermittent foot shock triggered body weight losses and slight elevation in core temperature. Further more detailed dose response studies using other behavioural models for anxiolytics and antidepressants will be necessary for more definitive inferences. Amongst all edible phytochemicals known to date, curcumin and other curcuminoids encountered in turmeric are clinically the most extensively studied ones [44,45]. However as yet little concentrated efforts have been made to systematically define their therapeutically interesting dose ranges and treatment regimen necessary for obtaining diverse therapeutic benefits offered by them, or for evaluating their protective potentials against diverse spectrums of lifestyle associated metabolic disorders and other chronic diseases. Our observation revealed that repeated daily oral doses of even 5 mg/kg C. longa is high enough as a stress response modulating agent, and strongly suggested that traditionally known medicinal and dietary uses of curcuminoids containing turmeric preparations are mainly due to their allostatic load regulating properties. Therefore efforts to identify a reliable biomarker involved in its protective effects against the observed stress triggered responses (i.e. body weight reduction and thermoregulatory disturbances) will be made in our laboratories. Such biomarkers could then be used for more systematically assessing its allostatic load regulating potentials in volunteers and patients. During such efforts proper attention has to be paid to the neuronal function modulating and antimicrobial activities of curcuminoids. To our judgments, the observed stress response modulating efficacies of metformin and C. longa are mainly due to their antimicrobial activities, whereupon their high chemical reactivity and metabolic instability inside the gastrointestinaltract play crucial roles. That such could indeed be the case for curcumin and other edible phytochemicals have often been pointed out during more recent years [46-48]. However, as yet little concentrated efforts have been made to identify and pharmacologically validate a rodent bioassay system necessary for deciphering the paradoxical polypharmacology of numerous drugs and phytochemicals with such properties and widely used in modern and traditionally known systems of medicine. Efforts to better standardize and further validate the mouse bioassay system for such purposes could eventually lead to a convenient and universally practicable preclinical model urgently needed for discovering and developing drugs based on our current understanding of the multiple functions of microbiota-gut brain axis, or for more evidence based planning of dietary therapies. Study revealed that C. longa could be functionally a metformin-like desensitizer of biological mechanisms and processes involved in stress induced physiological responses. Observed result indicated that stress response modulating efficacies of metformin and C. longa are mainly due affect microbiota-gut brain axis. As many other edible phytochemicals, curcuminoids the active constituent of turmeric could be a better therapeutic alternative for prevention and cure of comorbid psychopathologies accompanying environmental stress. Suruchi Verma thankfully acknowledges the Department of Science and Technology, Government of India, New Delhi, for awarding INSPIRE Fellowship (IF131112). Thanks are also due to Natural Remedies Pvt. Ltd., Bangalore for supplying generous gift sample of Curcuma longa extract along with its HPLC fingerprint. Han S, Yang Y (2005) Antimicrobial activity of wool fabric treated with curcumin. Dyes and Pigments 64: 57-16. Reddy N, Han S, Zhao Yi, Yang Y (2013) Antimicrobial activity of cotton fabrics treated with curcumin. J Appl Poly Sci 127: 2698-702. Moghadamtousi SZ, Kadir HA, Hassandarvish P, Tajik H, Abubakar S, et al. (2014) A review on antibacterial, antiviral, and antifungal activity of curcumin. Biomed Res Int doi.org/10.1155/2014/186864. Prasad S, Gupta SC, Tyagi AK, Aggarwal BB (2014) Curcumin, a component of golden spice: From bedside to bench and back. Biotechnol advances 32: 1053-64. Davinelli S, Sapere N, Zella D, Bracale R, Intrieri M, et al. (2012) Pleiotropic protective effects of phytochemicals in Alzheimer's disease. Oxid Med cell Longev doi: 10.1155/2012/386527. Gupta SC, Kismali G, Aggarwal BB (2013) Curcumin, a component of turmeric: from farm to pharmacy. Biofactors 39: 815-68. Gupta SC, Sung B, Kim JH, Prasad S, Li S, et al. (2013) Multitargeting by turmeric, the golden spice: from kitchen to clinic. Mol Nutr Food Res 57: 1510-28. Anand P, Kunnumakkara AB, Newman RA, Aggarwal BB (2007) Bioavailability of curcumin: problems and promises. Mol pharm 4: 807-18. Patel Pankti S, Roy SP, Patel N, Gohil KJ (2014) Curcumin as an antidepressant: A review. Res Rev J pharmacog phytochem 2: 29-34. Kulkarni SK, Dhir A (2010) An overview of curcumin in neurological disorders. Ind J Pharm Sci 72: 149-54. Goel A, Kunnumakkara AB, Aggarwal BB (2008) Curcumin as "Curecumin": From kitchen to clinic Biochem pharmacol 75: 787-809. Esatbeyoglu T, Huebbe P, Ernst I, Chin D, Wagner AE, et al. (2012) Curcumin-from molecule to biological function. Angew Chem Int Ed Engl 51: 5308-32. Rooney C, McKinley MC, Woodside JV (2013) The potential role of fruit and vegetables in aspects of psychological well-being: a review of the literature and future directions. Proc Nutr Soc 72: 420-32. Murphy T, Dias GP, Thuret S (2014) Effects of diet on brain plasticity in animal and human studies: Mind the Gap. Neural Plast doi. org/10.1155/2014/563160. Chatterjee SS, Kumar V (2012) Holistic psychopharmacology and promiscuous plants and principles of Ayurveda. Am J plant sci doi: 10.4236/ajps.2012.327120. Thakur AK, Chatterjee SS, Kumar V (2014) Adaptogenic Potential of Andrographolide: an active principle of the king of bitters Andrographis paniculata. doi: 10.1016/j.jtcme.2014.10.002. Thakur AK, Chatterjee SS, Kumar V (2014) Therapeutic potential of traditionally used medicinal plant Andrographis paniculata (Burm. F.) against diabesity. TANG 4: 63-70. Pulito C, Sanli T, Rana P, Muti P, Blandino G, et al. (2013) Metformin: On ongoing journey across diabetes, cancer therapy and prevention. Metabolites 3: 1051-75. Kim T, Davis J, Zhang AJ, He X, Mathews ST (2009) Curcumin activates AMPK and suppresses gluconeogenic gene expression in hepatoma cells. Biochem Biophys Res Commun 388: 377-82. Potter PE (2013) Curcumin: a natural substance with potential efficacy in Alzheimer's disease. J Exp Pharmacol 5: 23-31. Zethof TJ, Vander HJA, Tolboom JT, Olivie RB (1994) Stress-induced hyperthermia in mice: a methodological study. Physiol Behav 55: 109-15. Steru L, Chermat R, Thierry B, Simon P (1985) The tail suspension test: a new method for screening antidepressants in mice. Psychopharmacol 85: 367-70. Ojima K, Matsumoto K, Tohga M, Watanabe H (1995) Hyperactivity of central noradrenergic and CRF system is involved in social isolation-induced decrease in pentobarbitone sleep. Brain Res 684: 87-94. Straughan JL (2007) Focus on metformin-a major cardiovascular medication. Diabesity-the biggest epidemic in human history. Cardiovasc J Afr 18: 331-3. Shin NR, Lee JC, Lee HY, Kim MS, Whon TW, et al. (2014) An increase in the Akkermansia spp. population induced by metformin treatment improves glucose homeostasis in diet-induced obese mice. Gut 63: 727-35. Burcelin R (2013) The antidiabetic gutsy role of metformin uncovered? Gut 63: 706-7. Lee H, Ko G (2014) Effect of metformin on metabolic improvement and gut microbiota. Appl Environ Microbio 80: 5935-43. Pintana H, Apaijai N, Pratchayasakul W, Chattipakorn N, Chattipakorn SC (2012) Effects of metformin on learning and memory behaviors and brain mitochondrial functions in high fat diet induced insulin resistant rats. Life Sci 91: 409-14. Adeyemi OO, Ishola IO, Adedeji HA (2014) Novel action of metformin in the prevention of haloperidol-induced catalepsy in mice: Potential in the treatment of Parkinson's disease? Prog Neuropsychopharmacol Biol psychiatry 48: 245-51. Garaabadu D, Krishnamurthy S (2014) Diazepam potentiates the anti-diabetic, anti-stress and anxiolytic activities of metformin in type-2 diabetes mellitus with co-occurring stress in experimental animals. Biomed Res Int doi: 10.1155/2014/693074. Chattopadhyay I, Biswas K, Bandyopadhyay U, Banerjee RK (2004) Turmeric and curcumin: Biological actions and medicinal applications. Curr sci 87: 44-53. Selvi NMK, Sridhar MG, Swaminathan RP, Sripradha, R (2014) Efficacy of Turmeric as Adjuvant Therapy in Type 2 Diabetic Patients. Ind J Clin Biochem doi 10.1007/s12291-014-0436-2. Clarke G, Stilling RM, Kennedy PJ, Stanton C, Cryan JF, et al. (2014) Gut Microbiota: The Neglected Endocrine Organ. Mol Endocrinol 28: 1221-38. Dinan TG, Cryan JF (2012) Regulation of the stress response by the gut microbiota: implications for psychoneuroendocrinology. Psychoneuroendocrinology 37: 1369-78. Tilg H, Moschen AR (2014) Microbiota and diabetes: an evolving relationship. Gut 63: 1513-21. De Palma G, Collins SM, Bercik P, Verdu EF (2014) The Microbiota-Gut-Brain axis in gastrointestinal disorders: Stressed bugs, stressed brain or both? J physiol 15: 2989-97. Ji HF, Shen L (2014) Can improving bioavailability improve the bioactivity of curcumin? Trends pharmacol Sci 35: 265-66. Xu Y, Ku BS, Yao HY, Lin YH, Ma X, et al. (2005) The effects of curcumin on depressive-like behaviors in mice. Eur J pharmacol 518: 40-6. Xu Y, Ku BS, Yao HY, Lin YH, Ma X, et al. (2005). Antidepressant effects of curcumin in the forced swim test and olfactory bulbectomy models of depression in rats. Pharmacol Biochem Behav 82: 200-06. Zhao X, Wang C, Zhang JF, Liu L, Liu AM, et al. (2014) Chronic curcumin treatment normalizes depression-like behaviors in mice with mononeuropathy: involvement of supraspinal serotonergic system and GABA-A receptor. Psychopharmacol 231: 2171-87. Lee J, Jo DG, Park D, Chung HY, Mattson MP (2014) Adaptive cellular stress pathways as therapeutic targets of dietary phytochemicals: Focus on the nervous system. Focus on the nervous system. Pharmacol Rev 66: 815-68. Gupta SC, Patchva S, Aggarwal BB (2013). Therapeutic roles of curcumin: lessons learned from clinical trials. AAPS J 15: 195-218. Lopresti AL, Maes M, Maker GL, Hood SD, Drummond PD (2014) Curcumin for the treatment of major depression: A randomised, double-blind, placebo controlled study. J Affect Disord 167: 368-75. Sekirov I, Russell SL, Antunes LCM, Finlay BB (2010) Gut microbiota in health and disease. Physiol Rev 90: 859-904. Heger M, van Golen RF, Broekgaarden M, Michel MC (2014) The molecular basis for the pharmacokinetics and pharmacodynamics of curcumin and its metabolites in relation to cancer. Pharmacol Rev 66: 222-307. Chiou YS, Wu JC, Huang Q, Shahidi F, Wang Y, et al. (2014). Metabolic and colonic microbiota transformation may enhance the bioactivities of dietary polyphenols. J Functional Foods 7: 3-25.